Bill Clinton Gave North Korea $2 Billion, Two Nuclear Reactors-Mostly Fiction! - Truth or Fiction? Bill Clinton Gave North Korea $2 Billion, Two Nuclear Reactors-Mostly Fiction! Bill Clinton Gave North Korea Nuclear Reactors, $2 billion-Mostly Fiction! President Bill Clinton essentially gave North Korea nukes in 1994 by giving them $2 billion and two nuclear reactors. Bill Clinton reached an agreement in 1994 to “freeze” North Korea’s nuclear weapons program, and the idea that Clinton gave North Korea nukes doesn’t hold up. 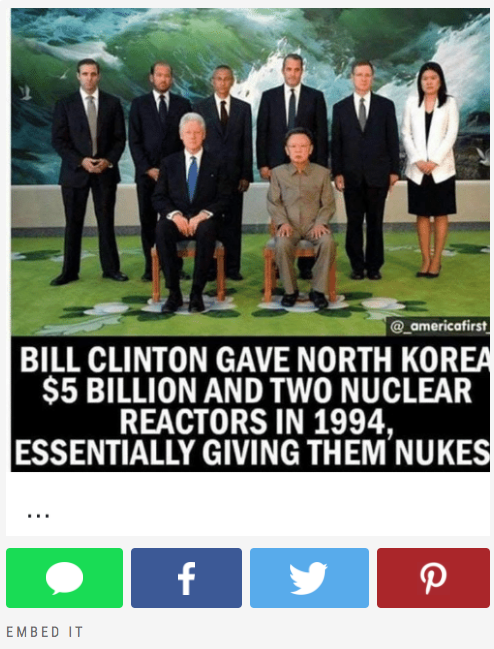 A meme claiming Bill Clinton gave North Korea $2 billion and two nuclear reactors misrepresents a 1994 nuclear deal. Bill Clinton reached a nuclear agreement with North Korea in 1994 that was billed as a “first step” in securing a nuclear-free future for the Korean peninsula. Known as the “Agreed Framework,” the two-page deal called for North Korea’s graphite-moderated (plutonium) nuclear reactors to be replaced with light-water reactor power plants. Light-water reactors are known for being the most “proliferation-resistant” because they can run for years on a single batch of fuel, and replacing the internal rods requires a major operation that is easy for weapons inspectors to catch. Given that these reactors replaced graphite-moderated nuclear reactors that experts believed were already part of a nuclear weapons program, claims that Clinton “gave” North Korea two nuclear reactors don’t hold up. The deal called for North Korea to receive 500,000 tons of heavy fuel oil per year to offset energy losses while the new reactors were built, and it called for trade restrictions on North Korea to be eased, in exchange for North Korea agreeing to shut down its nuclear weapons program. It appears that claims that Bill Clinton gave North Korea $2 billion are based on these incentives — but we couldn’t find any documentation about how much North Korea benefited financially, if at all. In the end, claims that Bill Clinton gave North Korea nukes and/or $2 billion and two nuclear reactors are mostly fiction. Most experts agree that the Agreed Framework at least succeeded in delaying North Korea’s nuclear weapons program by a decade or so. Starbucks Muslim Workers Slip Feces into Coffee, Spread Tuberculosis-Fiction!